Woke up this morning with hungry husband home from work. What to do for my carnivorous companion? Mmm. Bacon. But, the bacon was in unusable frozen block form! If I had planned ahead, I would have stored it in the refrigerator last night, but alas. Yet with the powers of thermodynamic convection (Good Eats S3E4), I was able to safely and quickly defrost the package. And don’t your dare just leave it out on the counter! Nope. Don’t even think about it. Food poisoning potential goes waaay up at counter temperatures and time. 1. Obtain frozen stuff in need of a quick defrost. Uncured bacon without added nitrates or nitrites… mmm bacon gets even better! 2. Cold (60F) water in sink. Check. Barely dripping faucet. Check. Frozen block o’ bacon transform! In mere minutes it was ready for the skillet. Obviously if you’re planning on defrosting a large block o’ turkey, give yourself a bit more time. Size, shape, and density matters. 3. 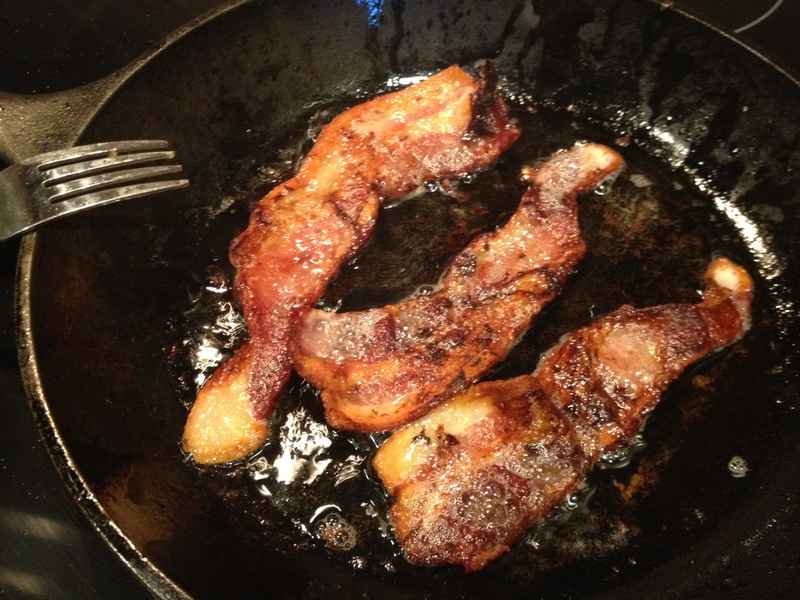 Bacon goes in a skillet set to medium heat or oven at 400F for about 12-15 minutes. With either method, cook until crispy. Ps. Wife suggests keeping husband busy making pancakes or he might eat all the bacon before it makes it to the breakfast table.